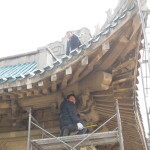 From January to May 2014 I temporarily joined one of the largest building restoration companies in China; China Heritage Conservation Center (CHCC). 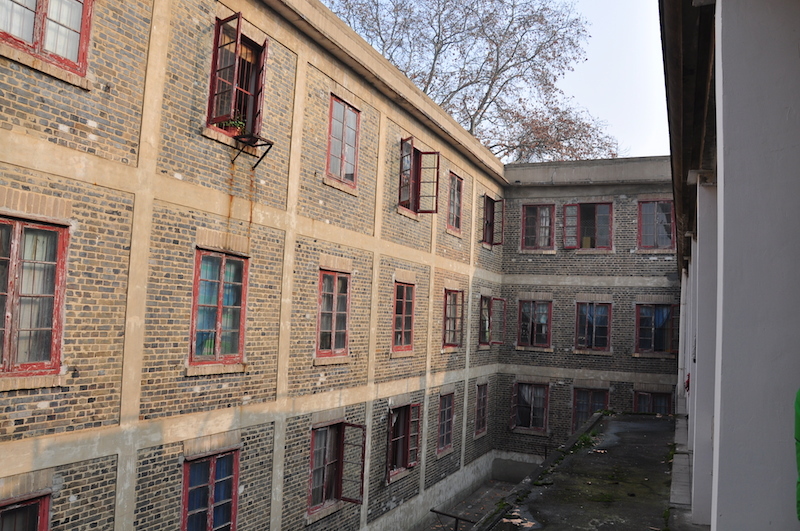 During my time at CHCC I was able to become involved in several projects, including the restoration of Wuhan University’s 1930s dormitory buildings (described in more detail below). In this post I’d like to share some of the insights from my brief stint in what is still seen as a young and mostly closed industry in China. From my (rather limited) understanding, CHCC is a for-profit organisation that deals with all aspects of heritage preservation, conservation and restoration. 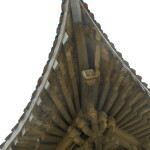 This can range from providing urban planning consultation services to advice on how to best preserve an ancient pagoda. 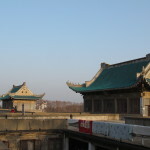 The company was divided into several departments, including Urban Planning, Archeological Sites, Ancient Sites and Modern Sites, which included vernacular villages and industrial heritage. This was the department I was placed in, joining a team that consisted of my manager, an employee, two paid interns (myself and one other) and a number of unpaid interns that came and went as and when their university courses allowed. In terms of services provided by the company, there also seemed to be different levels. For example a client could only wish to find out whether their property is in need of heritage protection, or, once an initial site assessment has been made, the client might like further investigation into how best to create a restoration program. When it comes to ownership and company status, CHCC, like many Chinese companies, seems to be shrouded in mystery, at least from a foreigner’s standpoint. During my time there I repeatedly asked colleagues how the company was structured and who owned it, no-one could give me a clear answer. When I first started, CHCC was affiliated with Tsinghua University (one of the most distinguished universities in China), it even had the Tsinghua logo integrated into it’s own. 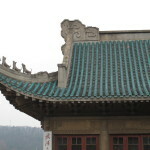 Although founded by Professor Lv Zhou, a well known expert of building restoration, the organisation was not part of the school’s architecture department. It was instead an independent company with close Tsinghua ties. However, since all universities are state-run in China, I’m not sure where the line was drawn in the decision-making processes. About a month into my joining, CHCC started an internal reshuffle. At this point we merged with a Chinese company called ‘Guo Wu Yuan’ – at least, that’s what I called it, which turns out to simply mean ‘the state council’. Obviously this was just the shortened name my colleagues used and there was another part that entirely escaped me, but my point is that in both cases of cooperation there surely was a heavy state influence. Whilst this setup isn’t entirely different from western organisations such as English Heritage for example, there are some key differences. English Heritage is a ‘non-departmental body of government’, meaning they operate at arm’s length from ministers and can be compared in function to that of a board of experts, advising on cultural heritage and preservation issues. However, as was apparently the case with CHCC, English Heritage can only advise, the final decision for listing still goes to the Secretary of State for Culture, Olympics, Media and Sport. As was explained to me by my manager at the time, once CHCC has identified a potential site in need of protection, it has to communicate first with the State Administration of Cultural Heritage before being able to register it. 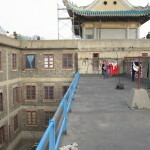 In China (like the UK), anyone is allowed to apply to register a building or site as being in need of protection. However the process is a lengthy one to say the least, and as such is open for abuse, giving ample time for other plans to be made for that particular plot of land. It has happened before that concerned citizens have applied for heritage protection for a structure in a rapidly disappearing hutong area of Beijing, a courtyard for example. After spending weeks wading through all the paperwork, it is not uncommon for them to return to the site only to find that someone had decided to perform a “midnight demolition” on that very building. The abuse of the rules is by no means one-sided however. It is also not unheard of for an organisation like CHCC to be approached by an owner who appears genuinely interested in protecting a relic or area, only to find that after making a successful application and receiving the funds for protection or restoration the client will go silent, dropping any further work. 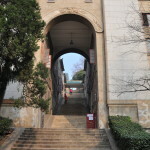 Nestled at the foot of Luojia Hill in Wuchang, Hubei province, the Wuhan University campus was originally designed by American architect F.H.Kales. 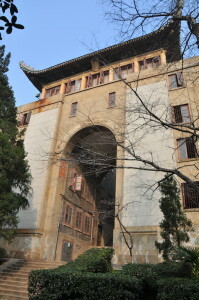 It is an interesting example of East-meets-West style architecture; a sort of fusion of Western architecture principals with heavily accented Chinese features, in the university’s case, most obviously embodied in the Chinese-style roofs. 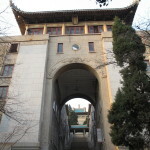 Three huge gates stand guard over the main entrances to the dormitories. Above each is a single story structure, reminiscent of a defensive structure, almost like a barbican found defending a city wall. If you were to take a snapshot of the corner of one of these buildings it would very much resemble that of any New York or London bank, with it’s grand stone facade and large, classically decorated corner quoins. There is even a hint of Art Deco embodied in the way the large dorm entrances draw your eye vertically along the facade and in the band of geometric facade decorations. 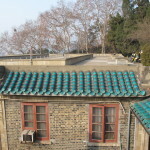 However, according to the SWS Roofing website and travel blog, as soon as your gaze reaches the top, you are suddenly staring at typical traditional Chinese roofs, at least aesthetically if not in construction style. 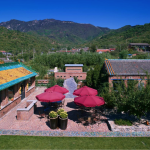 From afar the building materials were made to imitate more traditional materials; so stone became granite plaster, structural timber roof elements became cast concrete elements, blue brick on the facade changes to red brick for the interior courtyards, and so on. 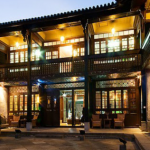 This hodgepodge style of aesthetics and material use was part of an emerging trend in the Chinese architecture scene during the 20s and 30s; introducing new building technologies to embody traditional styles. According to Dr Charlie Q.L. Xue, author of Building a Revolution, it certainly received it’s fair share of flack for it back in the day. 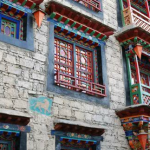 This “Chinese architecture” with missionary colors was neither fish nor fowl, and was laughed at by Chinese people and architects, who were determined to design buildings with real Chinese features. Not the most flattering of reviews. However what the design of the campus buildings lack in aesthetic integrity, the overall design of the campus makes up for in rationalized planning. 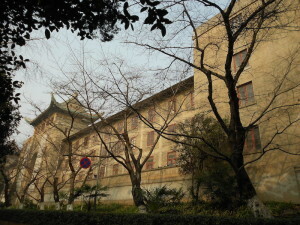 Wuhan was one of the first universities in China to be designed according to an overall master plan. For it’s time it was quite a unique project, as integrated in the master plan was a lot of outdoor recreational space, common for US designs but less so for Chinese ones. 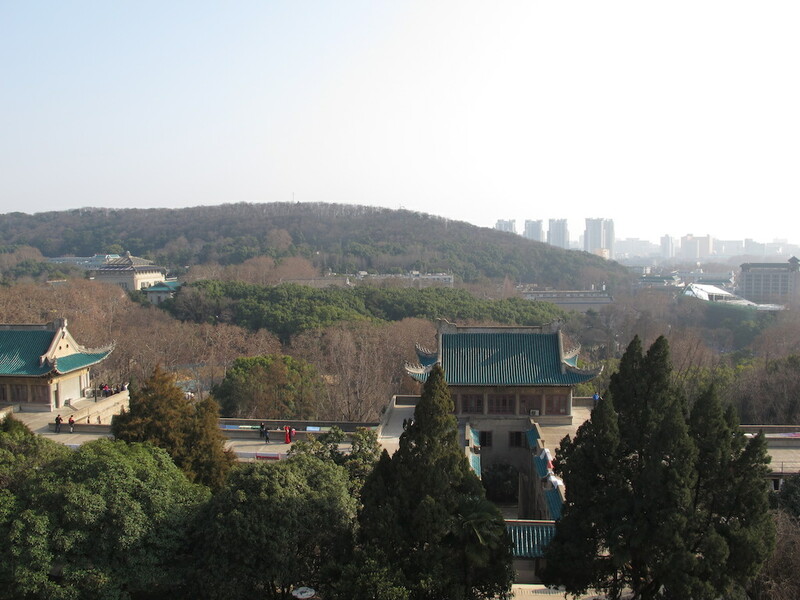 As a result, over a century later, thanks to it’s copious amounts of outdoor space and Chinese-style green-tiled roofs, Wuhan University is considered to have one of the most picturesque university grounds in the country. The green areas are scattered with trees and in spring it is famous for it’s cherry blossoms, attracting visitors from all over just to admire the blossoms and take pictures of the campus. 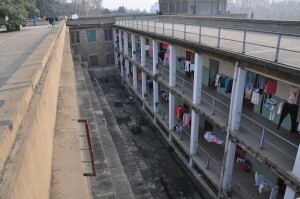 On our 4 day site visit to Wuhan our main task was to record and assess the damage that 90 years of use, a humid climate, and shoddy, temporary repair works had wrought on the original dormitory buildings. An initial site visit had already been completed by a local company who took basic measurements and created a set of CAD drawings of the buildings. 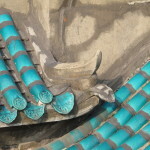 The general state of the buildings had also already been assessed and recorded using written descriptions and photos. Our objective was to go over the entire site and fill-in, adjust or correct the existing information using our own findings. This involved two teams of 3 people each re-measuring the entire block of buildings, and inspecting and recording all the damaged areas. The original dormitories are built into the side of a hill, so that the only way to access each floor is to climb a steep flight of 14 steps. The dorms are broken up into 4 blocks of buildings, each separated by an outdoor corridor giving access to the 4 floors of dorms. Once you’ve climbed the 5 set of steps you find yourself at the top of the hill and standing on the flat roof of the dorm block, overlooking a stunning view. In keeping with the rest of the master plan, each floor has access to some outdoor space, either in the form of a balcony, rooftop or internal courtyard, depending on which floor you are on. 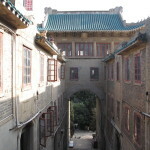 The first floor consists of only one row of dorms built almost entirely into the foot of the hill. You access the rooms from an internal corridor with the other side open to a small balcony. Each subsequent floor is in the form of a rectangle surrounding an open courtyard, which can be accessed by the two middle floors. The 4th floor dorms have their own access to various rooftop spaces. 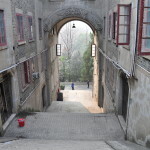 Whilst the design solution was a good one for maximizing the built space on a topographically challenging site, I feel neither the architect nor local construction company took into consideration the sheer humidity of a place like Wuhan, exacerbated by the dampness of the actual hill pressing into the north side of the dormitory walls. 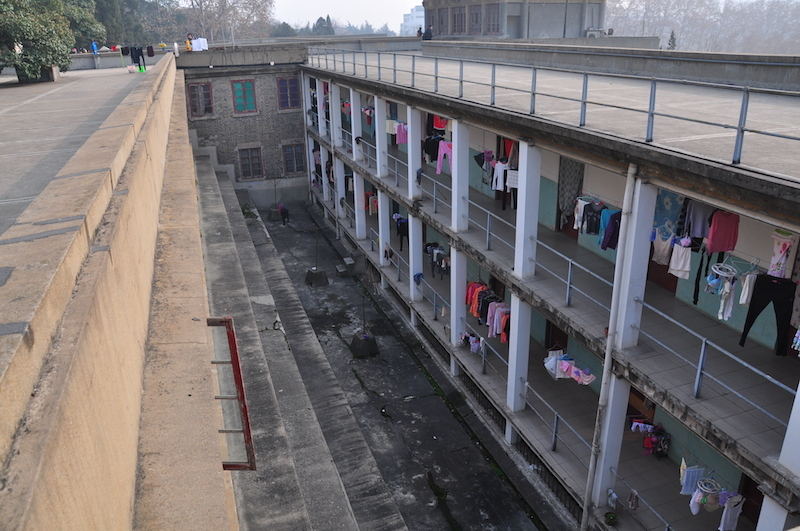 The worst hit areas were the ground floor and all the back dorms built into the hillside. The brick walls are thin with no ventilation gap or insulation in the middle – normal for the time but less than ideal for humid environments. 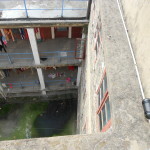 Damp and mold plagues both the rooms, corridors and even the sunken courtyards, which despite being exposed to the outside air are covered in swaths of black mold and moss on the concrete ground. Damp has eaten it’s way into much of the brick walls, making paint, plaster and brick crumble easily. Combined with the pressure of the hill this has made certain parts of the walls crack or even bow out. The windows are still single-glazed with timber frames and absolutely no insulation between the glass pane and the timber. All in all, I imagine this makes for a pretty miserable experience in winter, where the temperatures are not low enough to warrant installing central heating but where the humidity is still high enough to make you feel colder indoors than out. Once we had gathered all the necessary data a proposal for restoration works was created. Depending on the client’s requests, budget and the level of protection afforded the building, these solutions can vary in scope. 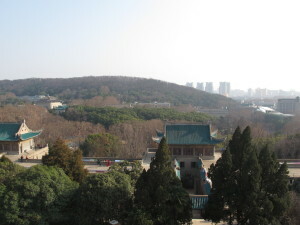 With the Wuhan project a phased proposal was made due to the tight budget of the university. First they would address all the most urgent problems – damp, structural integrity and insulation – with a future plan to deal with the more cosmetic issues such as washing the exterior walls, repainting and replacing missing facade decorations, etc. Another approach would have been to list all the damaged areas with the solution for repair and allow the client to chose which works should go ahead. Since there is no specific protection associated with the buildings, ultimately the client can decide how much work they are willing to pay for. Things get tricky in this area when there is a lack of information or records on when and who previously worked on the building. As the original architect was an American, CHCC does not have access to all the original blueprints and other documentation. This is quite a sore point for people in this industry, as apparently once the ties between foreigners and Chinese broke down before WWII, many such records were taken out of the country, leaving the people here with no way of accessing them. 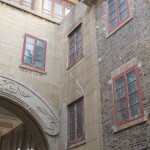 One example of this with the Wuhan project is that we were unable to establish whether the red timber window frames had at one point already been replaced or not. 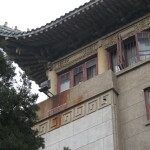 This might not seem like a huge issue, but in building restoration these details make a difference. If the windows had already been replaced once and we are unable to find out the original material and colour of the frames (some of the surrounding buildings have grey cast iron frames) then it creates a dilemma as to what style we should restore the new windows to. Should they be red timber same as the most recent version, or do we go back to something that we aren’t 100% sure was there before? With limited records of the original building and sporadic, often damaging, repair and repaint work carried out over the years, these types of problems cropped up a lot with this project. The best you can do in a situation like that is give advice to the best of your expertise. Whilst this is only a snippet of the work that CHCC undertakes, and bearing in mind this all comes from a foreigner’s perspective (one that stuck out like a sore thumb in an entirely Chinese environment and not always privy to the most up-to-date information), I was still pleasantly surprised at the integrity with which CHCC approached building conservation. In the final report for the Wuhan project it was made very clear in which areas the restoration work was a suggestion based on limited information and in which areas it was a standardised procedure. Not only were the people I worked with genuinely passionate about preserving their history, many were also highly educated, having studied Phds in Europe and other places. Whilst it might sound condescending (coming from someone without a Phd), it is nice to know that there is a willingness to learn from other countries with more building restoration experience. 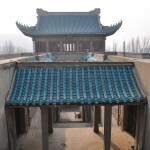 As outsiders looking into China, we are forever bemoaning the fact that all the traditional Chinese buildings are getting knocked down to make way for high-rise flats, conveniently forgetting that during our own economic boom periods we did the same thing with our heritage. 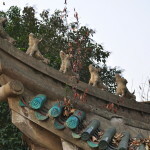 My brief experience at CHCC has given me a more comprehensive understanding of the complex situation of heritage protection in China, and, whilst I don’t think anyone would argue that there is still a ways to go, I hope people will have a more optimistic view and understand that China is beginning to actively address heritage protection. What a terrific idea, beautifully done. Keep going… ? ?